Contemporary interior features are exceptional. 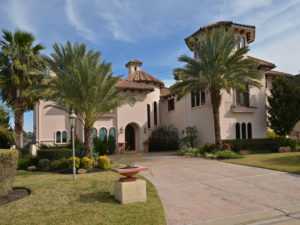 Wall of butted glass windows with lake views, saltwater aquarium, his and hers studys, master retreat with balcony, fireplace and sitting area, elevator, state of the art electronics and media room, camera security, open plan with soaring ceilings, 70W generator, exercise room, extensive art niches. Additional features include saltwater pool, outdoor kitchen, huge deck with boat and jet ski lifts and golf cart garage. Previous Listing31222 Rainwood Park LaneNext Listing11 Los Encinos Ct.